On the starship Sanctuary, Lord Mar-Vell has a conversation with the temporal anomalies who are being held prisoner. He believes one of them is the universe's avatar of death and must be studied. Mar-Vell approaches the anomaly that he senses contains the highest level of energy - Namorita. Before he can begin interrogating her, Dark Quasar informs his master that six powerful beings are approaching them. Suddenly, a stargate opens to reveal Nova, Quasar, Ronan, Silver Surfer, Gladiator and Beta Ray Bill! The cosmic heroes burst through Sanctuary's hull and immediately begin attacking the creatures from the Cancerverse. With a burst of strength, Ronan destroys the floor beneath him as he discovers the location of the prisoners. The Kree warrior finds himself facing the Cancerverse version of Venom. The monster is quickly destroyed by Ronan. Elsewhere in the ship, Gladiator and Beta Ray Bill continue eliminating their foes. The leader of the Imperial Guard informs Nova that the engineering decks will be cleared in three minutes. As his ally communicates with Richard Rider, Bill uses his powers to destroy the hideous versions of Wolverine and Colossus. Meanwhile, Nova, Quasar and Surfer blast their way through the Revengers and into the prisoners' detention area. As the evil Giant-Man begins to squeeze Namorita, Quasar uses his quantum energy to form a slingshot. Wendell hits his giant enemy with an energy rock in the head. Rich instructs his friend to grab the falling Namorita while he tackles Lord Mar-Vell. Despite the WorldMind's warnings, Nova begins to battle the more powerful opponent! The human rocket tackles Mar-Vell into the wall only to receive a powerful energy blast in return! The Silver Surfer picks up Lord Mar-Vell and flies him into the air. However, the silver-skinned hero also gets blasted to the ground by his adversary. Nova rejoins the battle and unleashes a barrage of energy blasts at the invasion's leader. The attack has no effect as Mar-Vell begins probing Rich's mind despite the psi-shields activated by the WorldMind. As they exchange punches, Mar-Vell reveals that he knows Namorita is Nova's top priority at that moment. As Richard Rider is stunned by a powerful punch to the jaw, the super-villain from another dimension says he is going to give Nova eternal pain. Rich screams out as the energy blast hits him! In the Cancerverse, on the moon of Titan, Drax and Star-Lord confront each other over Drax's murder of Thanos. Drax tries to explain that he was genetically coded to destroy the mad Titan. Peter Quill argues that Thanos was their best option to stopping the Cancerverse invasion. Their teammate, Mantis, points out that their arrival in a universe governed by life made Drax's compulsion even worse as he is an avatar of life. Their argument is suddenly interrupted as Thanos's atomized form begins to reform! The process is extremely painful for the Titan but he survives. Thanos explains to the Guardians of the Galaxy that he was rejected by Death and sent back to life to complete the mission. Drax suddenly breaks free and races forward to confront his foe. However, this time Thanos is prepared and obliterates Drax with an energy blast! Back on Sanctuary, Lord Mar-Vell senses the death of Drax who was an avatar of life. He realizes the avatar of death he has been looking for is in his universe and immediately orders the Revengers to return with him. After they depart, the heroes regroup and check in with the other groups. Gladiator informs Nova that the engineering levels are secure and Ronan has freed the prisoners. As they fly through the ship, Rich and his team suddenly find themselves facing a large energy symbol left by Mar-Vell. The symbol suddenly explodes and Sanctuary is destroyed in a blast of light! 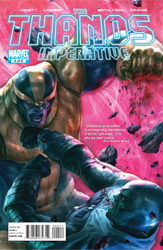 Back in the Cancerverse, the Vision explains that the planet Titan is no longer safe due to the death of a life avatar. Their location has been revealed as a result. Suddenly, alarms begin sending alerts to warn the freedom fighters that the planetary shields have been penetrated. The Guardians turn to face a group of Revengers who have just arrived!